Well we are very thankful for the weather received over the Easter long weekend. It wasn’t looking too good this time last week but the rain and wind stopped Friday morning leaving us with perfect fishing conditions, and the Sunshine Coast reefs fished well too. 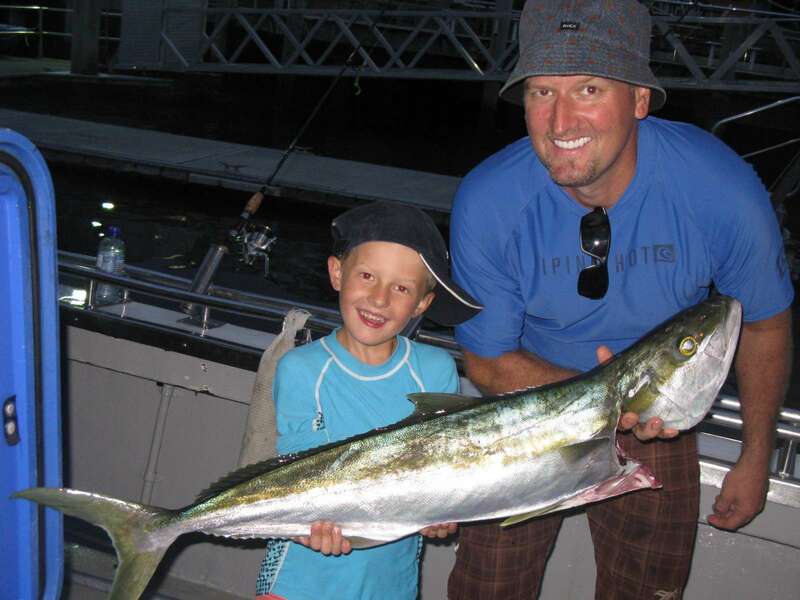 Pelagics’ like mackerel, kingfish, amberjack and big trevally were boated as well as some tasty reef species like coral trout, pearl perch, squire and tusk were pulled up from the bottom. The spanner crabs were hungry as well especially on the full day trips with hauls of up to 64 keepers. The current was quite strong out wide on our full day charters’ but it didn’t seem to stop the fish everyone had a good bag of fish and crabs to feast on over the Easter break. We had ½ day charters on Saturday morning and afternoon and tried 3 different reefs- Currimundi, the Caloundra 9nm and Murphy’s. Fish were put in the esky from all but the afternoon session on Murphy’s was probably the most productive some quality kingfish 5-8kg, squire, sweetlip, tusk fish, hussar and moses perch all coming home with us for dinner. They might have liked the hours leading up to the full moon rise. 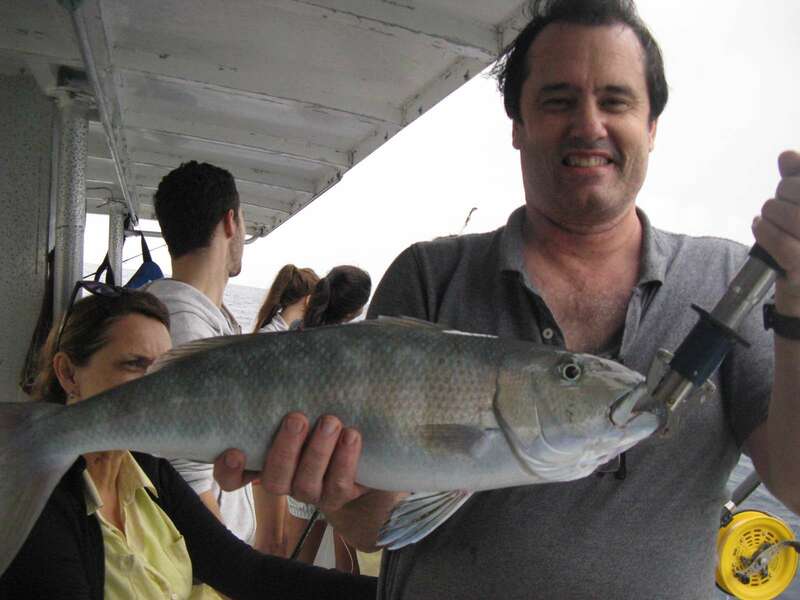 The 9nm provided tusk fish, sweetlip, squire, coral trout and morwong and we had school mackerel, big estuary cod and moses perch from Currimundi reef. 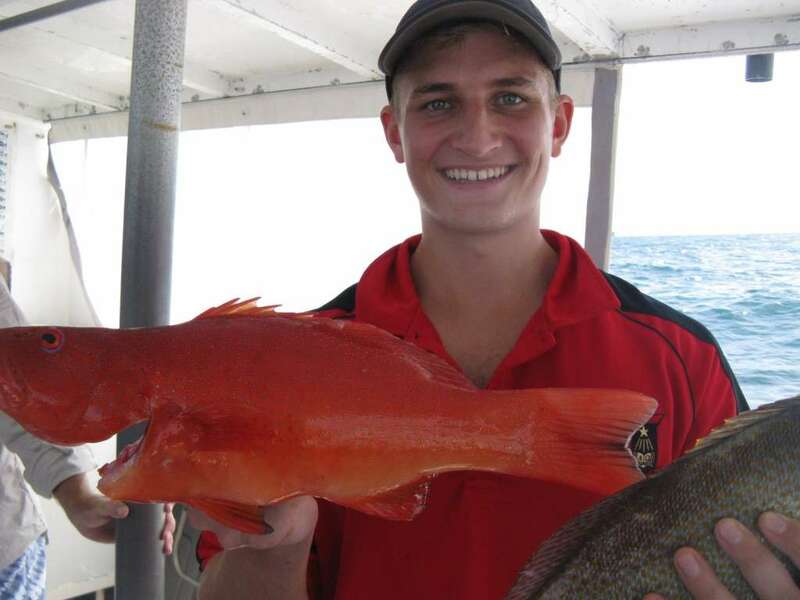 The picture below shows a beautiful coral trout caught on a cut pilchard, well done mate! The full day charters were spent on the Barwon banks and the variety of species caught never ceases to amaze me. There were good numbers of amberjack in the 3-5kg range some nice size pearl perch, rosy and green job fish, squire, lots of tusk fish, big trevally to 7kg, kingfish, fusilier and moses perch to name a few. The picture below shows a 4kg green jobfish which are pretty rare for our reefs and top of the table as far as eating is concerned well done Greg! This last photo is an 8kg king fish that took a live yakka on a paternoster rig. One of our regulars Doug and his son Jai were very impressed, good work boys. If you would like to join us for a trip head over to contacts page and drop us a line or call anytime. We do still have some availability for the remainder of the holidays. Until then HAPPY HUNTING!